This past fall brought a devastating hurricane to the East Coast resulting in the destruction of homes and businesses, leaving many families without secure safe housing and businesses in need of rebuilding or complete closure. Hurricane Sandy was a Category 1 storm off the coast of the Northeastern United States who made landfall in Atlantic City, NJ on October 29th. Sandy became the largest Atlantic hurricane on record measured by diameter with winds spanning 1,100 miles. Current estimates of damage exceed $65B which will rank it as the 2nd costliest hurricane since Katrina. The number of families and businesses left homeless from the destruction is in the tens of thousands. 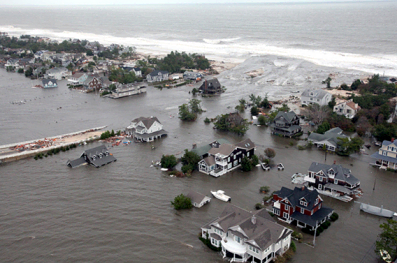 The states of New Jersey, New York and Connecticut are currently in the midst of a recovery and reconstruction, which is expected to take years to complete. Disaster relief efforts include state and federal organizations searching for structures for both living and business use during this reconstruction phase. These structures need to be portable and durable. Repurposed shipping containers have been used for disaster relief efforts across the globe where these natural disasters have displaced thousands of individuals either permanently or temporarily. Our summary of features below highlights the use of these containers as a great solution for disaster relief organizations. Easy to Transport - A conex box can be easily moved and transported on flat bed trucks and require only a level surface at its location. Extremely Versatile - The modification of repurposed shipping containers can include the installation of electric, insulation, cooling units and a variety of openings for access and ventilation. Safe and Secure - Solid reinforced steel construction and a wind and water tight certification make these portable structures ideal as a protective living, work or storage structure. A modified repurposed shipping container can be transformed into a variety of structures used in a disaster relief operation. Beyond the housing capabilities, these structures can be used for office space, clinics, military or police posts. For more information on how Falcon Structures can assist in our most recent natural disaster, give us a call at 877-704-0177.